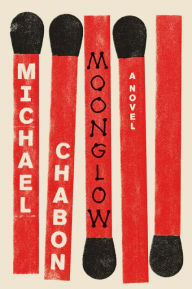 Would that we could all memorialize our grandparents as well as Michael Chabon does in his new novel, Moonglow — a blend of fact, fiction, memories, and research. It's an innovative form for fiction Chabon writes here — not exactly a memoir, not exactly a novel, but with elements of both. The end result, though, is a funny, messy, heartfelt tribute to his family, and it's a terrific reading experience. The story is based on some deathbed conversations Chabon had with his grandfather as his grandfather died of cancer in 1989. It took until recently for Chabon to develop the format he needed to tell this story — as well as one recent massive discovery (which would be a spoiler to reveal) about his grandmother that surely pulled this all together for him. The novel includes about five main strands of the story of his grandfather's life, but like memory itself, they're not arranged chronologically (despite, amusingly, his grandfather's insistence that Chabon do so if he wrote this). These stories flit in and out of themselves in the way memories do as well — they launch from a single thought or an object, or a taste or smell. Chabon also includes his own memories of his grandfather telling him these stories — the time he wanted beer with his pills or about how he got angry when Chabon continued a particular line of questioning. But Chabon's grandfather is the star of this show — the man led an unquestionably fascinating life. He was a World War II special agent who spent time behind enemy lines trying to track down the German V-2 rocket and its inventor, Wernher von Braun. Post-war, he married a beautiful but mentally unstable woman who had endured her own horrific hardships during the war (she's French and immigrated to the US after the war, barely surviving with her daughter — Chabon's mother). And he spent time in jail in the late 1950s for strangling his boss with a phone cord (this is the anecdote that leads off the novel, so right from the opening pages, we're on board with this guy to find out what he'll do next). Throughout his life, he was fascinated with rocketry and going to the moon — even building a model moon colony, a sort of symbol of escape from his troubled life specifically, but troubled life in general here on this planet. Though Chabon loses a little momentum in the last 75 pages or so, and at times, his structure does make it a little hard to keep track of where we are in time and what's already happened, on the whole, this is a fulfilling and enjoyable read. Chabon is a fantastically talented writer, as I'm sure you know — and this is as good as any of his best work.